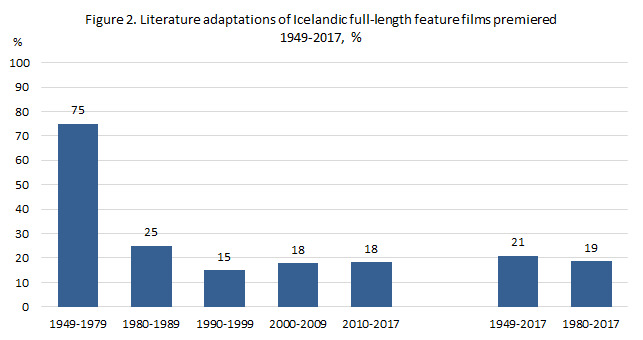 Altogether 191 Icelandic full-length cinematographic feature films have been premiered in Iceland since 1949 to the end-of-year 2017. Nearly all of the films have been directed by men, or nine out of every ten films. Drama is the most common genre of these film and then comedies. About one of every ten is classified as children and family films. The first Icelandic full-length feature film was premiered in 1949. In the 1950s five domestically produced full-length features were premiered, but only two in the 1960s and 1970s. Every year since 1980 has seen premieres of domestically produced full-length feature films, usually more than one and two a year. The number of premieres was highest in 2011when ten films were released for the cinema. Since 1949 until end-of-year 2017 191 domestically produced fill-length feature films have been premiered or nearly three films on average per year (see table 1). Note: Added numbers of directors and genres do not have to sum up to the number of films as films can be directed by more than one director and films are usually classified by more than one genre. Of the 191 films premiered since mid-last century male directors outnumber greatly female directors. Of the total number of directors, women number only 25 compared with 177 men. This equals one woman director against nine male directors (see figure 1). The total number of directors is a little higher than the total number of films as some films are co-directed. Conversely to what might be expected the share of women as directors has lowered somewhat in last years. Share of women directors was highest in the 1990s, when women directed 21 films, compared with six per cent since 2010 (see figure 1). The film is a specific art form with its own approach of storytelling and choice of subjects. This can partly be explained by the fact that only two of every ten films premiered since 1949 are literary adaptations (see figure 2). 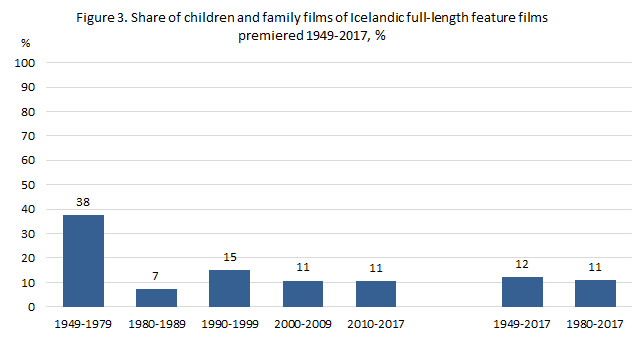 Only one of every ten Icelandic movies premiered since 1949 are classified as children and family films. Those were most common in the 1990s, when their share of all films reached 15 per cent (see figure 3). Two out of every three movies are in the drama genre. Comedies come second, four of every ten and 16 per cent are action movies and thrillers. Other genres are much less uncommon (see table 2). Note: Films are usually classified by more than one genre. Of the 191 films premiered since 1949, 76, or four of every ten, have been co-produced in partnership with foreign producing companies (see figure 4). Foreign producers come from 26 countries, most from the Nordic countries. Before the 1990s Icelandic films were rarely produced in co-operation with foreign producers. In the 1990s six of every ten premiered films were made in co-operation with foreign companies. Since then the share of co-productions has declined as only 39 per cent of domestic films premiered 2010-2017 were made in foreign partnership. The falling share of co-produced films can be explained to some extent by technical changes in the process of film production which have eased somewhat the high financial risks involved in film production. 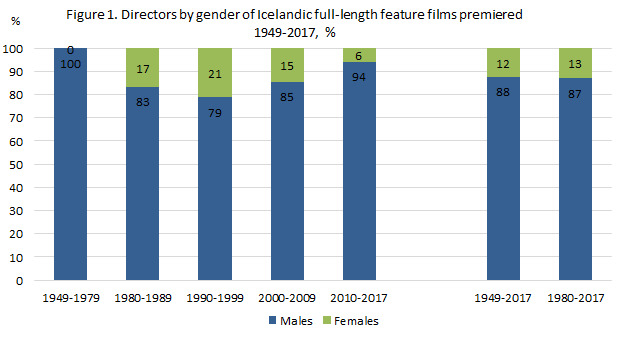 Of producers from single countries German (28 films) and Danish (22 films) producers have most frequently been minority co-producers to Icelandic films. Norwegian producers have participated in the production of 19 films, British producers of 16 films, Swedish producers of 14 films, and French producers of 10 films. Participation of producers from other countries is less common. 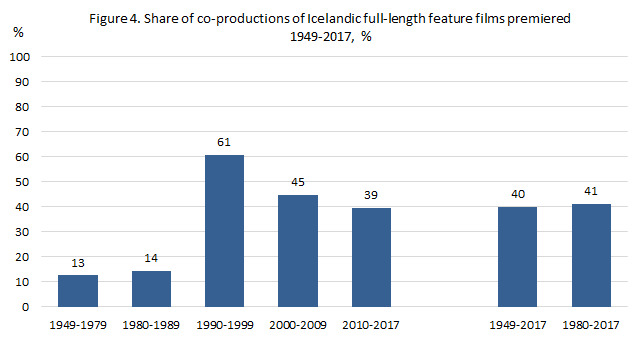 From 1967 to 2017 Icelandic film producing companies have participated as minority co-producers in production of 35 foreign full-length cinematographic films in cooperation with producers from 25 countries altogether. Most common is participation with US producers (11 films) and Danish producers (9 films). Information about the film are derived from The Icelandic Film Institute‘s data base Icelandic Films, European Audiovisual Observatory’s Lumiere Data Base and the Internet Movie Database (IMDb). Full-length feature film is defined here as cinematographic film which at least one hour running time. TV movies and documentaries are hence excluded.